Published on September 19, 2014 September 24, 2014 Author Rauner LibraryLeave a comment on North Britain or Scotland? In the wake of the Scottish referendum, we thought we'd share a little gem in our collection that has varying degrees of connection to independence, Scotland, and Great Britain (although not to the West Lothian question). George Taylor and Andrew Skinner were Scottish surveyors from Aberdeen who initially rose to prominence through their careful mapping of the post road between London and Bath. For their next endeavor, in 1776, the two men published what amounted to the first road map ever made of Scotland. Needless to say, this was also an important year for yet another group of oppressed colonists of England. Less than a decade later, Taylor and Skinner would journey west across the Atlantic to ply their trade in the new country of the United States of America. The atlas consists of 62 plates, each containing three side-by-side sections of a long strip of road. All but one radiate outward from Edinburgh at a one inch to one mile scale. The atlas includes a detailed chart at the front of the book that gives the distances between each stage of the journey as well as the total distance from Edinburgh. 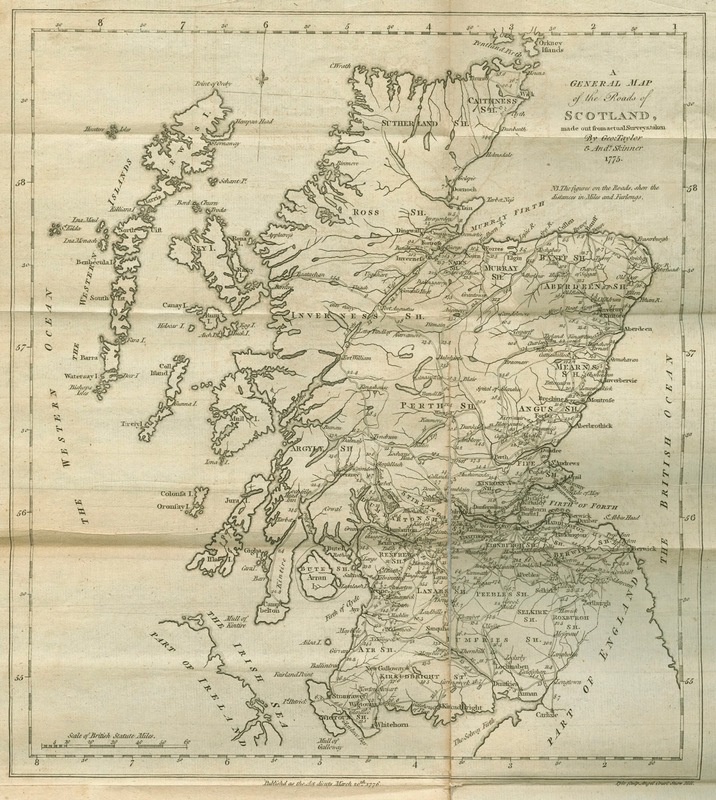 In their explanation of the chart,Taylor and Skinner assure the nervous traveler that "There are good inns on all the Roads, with Post Chaises and Horses at every Stage, as far North as Inverness by Aberdeen," an area with which they were well acquainted. In closing, the two express their confidence that the public road system will be soon completed in the north because "a Spirit of Improvement prevails throughout Scotland." One might venture to say that the recent referendum suggests that such a spirit still lives on in the hearts and minds of the Scottish people, even though there may be some differences of opinion as to what form that improvement should take. To see our copy of Taylor and Skinner's Survey of the Roads of North Britain or Scotland, walk into Rauner and ask to see Rare G1826.P2 T3 1776. If you aren't able to come by but would like to see more, the National Library of Scotland has scanned the book in its entirety and made it available online to the public.